Adding bikes to the traffic mix means adding suitable signage and road markings so that everyone on the road understands where to expect bikes. 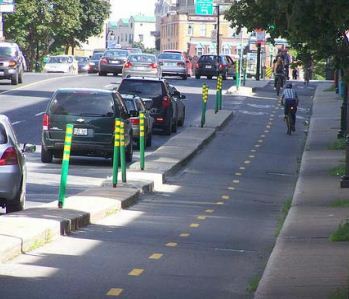 These changes are called “bike accommodations” in urban-planner-speak. They can range from minimal (“Share the Road” signs) to extensive (separated cycle tracks, bike lane markings, and even bike-oriented traffic signals). A great place to start learning about bike accomodations is this appendix of the Newton Bicycle Network Plan, which includes helpful summaries of different accommodations that have worked in many communities around the U.S. If you want to look deeper, take a look at this list of research sources compiled by Steve Runge of Bike Newton. Still not satisfied? bicyclinginfo.org is the premier website covering all aspects of bicycle advocacy. Finally, the most recent manual for signs and lane markings from the US Federal Highway Administration includes an entire chapter on bicycle accommodations. Happy researching!